Click to download the dashcam photo card. Holidays can be stressful, but a funny Christmas card that arrives in the mail or an inbox can bring a smile and laugh, lightening the most challenging days of decorating, shopping, organizing, or trying to do everything at once. It's surprising how a twist of familiar words, play on an idea or theme, or visual image can spread holiday cheer. Use the free printable card versions above and below, along with helpful Adobe printable tips to send cheer to friends and loved ones. The card above features Santa caught in the dashcam, and the Chemistree holiday card is sure to elicit a chuckle from fellow science fans. Click on the card you want to print to open the associated PDF file. 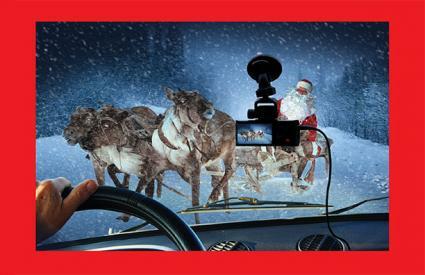 A play on the use of dashcams, the simple card featured above is sure to get some giggles. Inside of card - Verse that reads, "Dashcam through the snow. 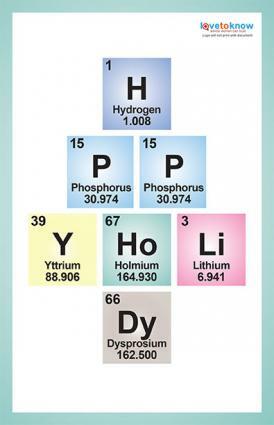 . ."
Send happy holiday wishes with this "Chemistree" card! Inside of card - Wording that says, "May you find the perfect Chemistree this holiday season." Sending humorous, unique greetings to family, friends, and colleagues is a wonderful away to keep in touch with those both near and far. These simple ideas are a great way to tuck some snickers into an envelope or shoot out electronically to those who will appreciate a good rib tickling. Inside of card - Saying that reads, "We whisk you a meringue fudge mousse and a big glass of cheer!" Use clip-art, cut-out pictures, hand-draw, or take a photo of the different items and print or secure to the front of the card. Kick it up a notch by adding a miniature wire whisk, available from suppliers like Firehouse Pantry, by punching holes a third from the top and the bottom of the card front and slide through. Foodies will love this. Coffee, Tea, or Something Silly? Front of card - Wording that reads, "We wish you a Merry Creamer. . ."
Inside of card - Wording that finishes with "...and a Caffeine New Year." Secure single serve coffee packets, Via from Starbucks as an example, to the inside of the card with a cute sticker, like those available from Stickers Galore or at a local craft store. These will keep everyone alert through the season. Alternatively, you could write "We wish you a Merry Christmas" on the front and ". . . a Hap-Tea New Year" on the inside. Attach different varieties of tea bags to the inside of the card in similar fashion to the coffee packets. Drinkers of coffee or tea will appreciate the laugh. Inside of card - Sentence with the sentiment, "Feel free to wine as much as you want over the holidays." Find a picture, clip art, or cut out of nice glass of wine for the front and add a bow, real or clip art, to the stem of the glass. If created to go with a gift, a bottle of wine might an ideal suggestion. Front of card - Ask your recipient, "When everyone, from A to Z, helps in the kitchen with holiday baking, who is always the favorite?" Inside of card - Let them know it's "Cook E!" A great card idea for kids, who always love a silly joke, frame the question on the front of the card with a cute holiday frame, border, or create your own, such as one found at My Cute Graphics, Page Borders, or Freepik, which offer both free and premium options. Tie to a box of holiday cookies and it could be the best treat ever. Inside of card - The wording, "Good grill to men." Put a nice, big, juicy hamburger (and don't forget the cheese) on the front. Check out ads for fast-food places, restaurants, or browse food magazines for some great burgers to cut out or look through available clip art. Locate a picture of a great BBQ grill to which a red bow or holly spring could be added. If the card will accompany a joke gift, add a quirky bottle of barbeque sauce, silly chef's apron or hat, or odd-shaped burger spatula. That will get the recipient salivating, for certain. Front of card - Wording like "Guess how the Santa garden gnome laughs when he hears a joke?" Inside of card - Provide the answer of "Hose! Hose! Hose!" Choose a picture of a Santa garden gnome (drawn, cut-out, or printed picture) to paste either above or below the text for the front. Inside, either print the punch-line in a sentence or list form, based on preference, or cut out pictures of three identical hoses to include. This is also a great card to accompany a gift like garden tools, seed packets, or, perhaps, a Santa Garden Gnome to call their own. Front of card - Message from a warm spot, like "Greetings from Arizona!" Inside of card - Wording that says, "Enjoy the snowman we (or I) made for you." This card set-up works well with a postcard-type photo as the main photo. Check out Pixabay for great images of desert landscape. If working in Microsoft Word, use WordArt to create a banner with the "Greetings from" line to give it an authentic postcard feel. Inside, under, around, or on the opposite side, paste cut-outs from pictures, magazines, or clip art of pieces of coal, charcoal briquettes, even buttons, enough to represent the eyes and mouth, a carrot for the nose, hat, scarf, sunglasses (for a bit of added humor), and any additional décor. This trick will make it appear like the snowman melted right inside the card. Use a spray bottle to spritz water over the entire inside of the card. It will now look like it was drenched. Be sparing with the spray on the backside of the card front so as not to run the ink on the postcard picture side. This will allow a slight pucker just enough to pull off the joke. It may take a little experimentation, but the end result is great. Inside of card - Wording that says, "'Stache-ing through the snow"
The first option is to use an existing picture and either draw mustaches on everyone using a permanent marker or add mustache stickers. Next, dot the entire picture with snowflakes, whether bedazzled, punches, bits of cotton (think the end of a cotton swab), or white paint market. The second option is to take a photo with all the participants' mustaches adorned. Oriental Trading Company is a great place to find mustache or snowflake items, for any of the picture options. A third option is to have one, or several, mustaches on the front of the card (drawn, cut-outs, stickers), and add snow or snowflakes. It may be the trendiest, and funniest, card anyone gets this year. Front of card - Saying that reads "Wishing you lots of Christmas C.H.E.E.R." Inside of card (version one) - Wording that says, "Cash. Hamiltons. Euros. Eight Figures. Rocks." Inside of card (version two) - Wording that says, "Cookies. Honey Buns. Eclairs. Egg Nog. Red Velvet Cake." Depending on the audience, choose money or sweets and add images to the front from a graphics program or magazine. On the inside, the words can be organized in either in a sentence or placed in list form. This one offers something for just about anyone on the Christmas card list. Front of card - Ask the question, "What does one Christmas tree give another Christmas tree before meeting under the mistletoe?" Inside of card - Include the answer, "An orna-mint." Cut or draw two Christmas trees for the front. Secure a mint candy underneath the text inside. A stick of mint gum, starlight peppermint, or small container of breath mints will also work. Whoever receives the card will have the benefit of laughter and fresh breath. Front of card - Include the joke question, "Why did Rudolph tattle to Santa?" Inside of card - Provide the answer, "Because, Olive, the other reindeer, used to laugh and call him names." Add a picture of Rudolph and Santa to the front of this card and it practically makes itself. Just imagine how many eyes will roll with this one. Front of card - Write the question, "What's the last thing Mrs. Claus says when she hands Santa his umbrella on Christmas Eve?" Inside of card - Answer, "Watch out for the rain, dear." Lots of different ways to decorate the front of this card are out there, from Santa and Mrs. Claus standing side-by-side, a simple umbrella picture, covering the entire front with raindrops, using a boarder around the question, or just a cool font. Regardless, be assured a groan may be heard miles away when the card is read. Front of card - Strips of Christmas or holiday wrapping paper with speech bubbles saying things such as, "A jingle bell here and a jingle bell there," "Santa, Santa, he's the man," or "I say joy, joy, joy"
Inside of card - Write the phrase, "Thought you might appreciate some cool rappin' paper this year." Cut strips of wrapping paper and secure to front of the card. Create speech bubbles or use speech bubble stickers, like can be found on Amazon, write in "rappin'" phrases and stick onto the paper so it looks like it is talking. Put text inside card and these are ready to groove. The wrapping paper pieces can be done in a variety of ways, too, such as cutting it to look like a rolls of wrapping paper, assembled in a patchwork style, or adding bows to square or rectangle shapes to look like packages. This is a great project for kids. Take a few puns and turn them into holiday hilarity sure to make anyone smile. Inside of card - Sentence that reads, "Podiatree helps keep you in step all season long." Cut out or print a picture of a plain pine or fir tree and a variety of bare feet. Secure the tree to the card and decorate with feet. Add real ribbon to the top of the feet to create the look of ornaments or cut out click art bows. You can also do a variety of this by cutting out pictures of shoes and changing Podiatree to Shoe Tree. Inside of card - Phrasing that states, "Stay in shape with this Geometree over the holidays." Use a variety of shapes, squares, rectangles, circles, and triangles, making sure it is clear the forms are clearly defined. Foam shapes from a craft store will work really well for this design, too. Assemble into a Christmas tree shape and put on the front of the card. Inside of card - Sentence that says, "Let this Pageantree make your days sparkle." Start with a plain pine or fir tree, or find one in a bright color like purple or pink, and a variety of beauty pageant-related items such as crowns, tiaras, scepters, pageant sashes, even high heels. Secure the tree to the card and decorate. Add real or clip art ribbon to the top of each item and flourish using small gems from craft stores and lots of glitter to embellish thoroughly. Inside of card - Phrasing that says, "This Pastree will keep you in dough over the holidays." A cut-out or printed pine or fir tree will be the base to which you can decorate with cut-outs or pictures of donuts, danish, bread, cakes, adding real or printed bows to give the look of ornaments. Tie this card to a box of donuts and it is sure to be a hit! There are many places to find pre-made cards that area good for a Christmas chortle or two, for purchase in printed form or to send electronically. Stonehouse Collections - Charming boxed cards with a variety of cute and funny choices. Zazzle - Adorable cards from which 1- 2000 can be purchased, based on need and many of the designs come in varying sizes. Mescards - These free cards are customizable, printable, and use a template that works on standard paper. American Greetings - This well-known brand has a membership-based service that lets cards be printed right at home. Hallmark - Featuring many familiar characters, the subscription has multiple plan levels, to meet every need. Care2Cards - Wonderful free cards that have the extra perk of a making a charitable contribution with each card sent through sponsors. Whether handmade, printed, punny, pre-purchased, silly, or a groaner, a funny Christmas card is a sure way to bring warmth to even the chilliest of winter days. Though cards may be sent traditionally with a stamp or speedily via any variety of social media outlets, there will be much about which to smile, even the letting loose a guffaw or two, when this year's Christmas card is opened.